can be defined as a nature whose status has not been conditioned or altered by humans. The work carried out over 25 years by the MW movement worldwide attempts to change behaviors to achieve a balance between man and nature and to preserve the wilderness of the mountain. But how can this work be evaluated? To address this question Mountain Wilderness International has launched an innovative project: the “Mountain Human Footprint” project with the aim to assess the human impact on the highest peaks of the World. An evaluation template, defined by MWI, has been tested on four peaks in Bolivia (the Sajama, the Acotango, the Huayna and the Jhanko Laya) by four MW Catalonia members, including MWI president, Jordi Quera. This is the key tool to achieve this objective. 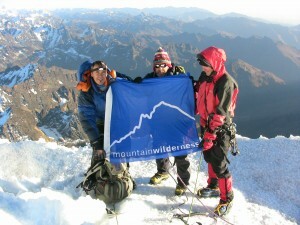 The expedition enjoyed strong local support from various organizations and people involved in mountain activities. in various mountain sports. This expedition laid the ground of the work which now could be implemented on all the globe Mountain Ranges. To carry-out this project, MWI needs to capitalize on as many Mountaineering practitioners as possible using the “Footprint Mountain Ratio” template to establish a large survey of the status of the wilderness of our mountains worldwide. This project is a milestone in the awareness and preservation of natural areas. It is undoubtedly an important first step toward further work that could more generally assess the “ecological footprint” of human presence on our mountains and monitor its evolution.